Are you seeking remedies for neck rashes? Neck rashes are itchy, irritating and burdensome. Although rashes have a variety of causes, discovering and relying on remedies for neck rashes may help the discomfort of the condition until the underlying source is treated and controlled. Common rashes, such as a neck rash, may appear as a result of a skin allergy from harsh soaps, detergents or lotions, or may be a symptom linked to an underlying disease or medical condition. Adults and babies alike may experience an itchy, inflamed neck rash. In hot, humid and sweaty months, a neck rash in a common occurrence. For those with skin conditions such as eczema or dermatitis, a neck rash may occur frequently. In addition to heat rash or skin allergies, sun exposure and sunburn may also cause skin irritations. The following remedies may help control some of the side effects of a rash. Cold water baths: A cold water bath may relieve some of the symptoms of an itchy rash. Cool water has a soothing quality that can help calm irritated skin. To benefit from a cool water bath, soak deeply in the tub until the neck region is immersed in cool water. Young children and babies may benefit from a cool water sponge bath. As always, make sure infants and small children are never left unattended while bathing. Baking soda compress: A baking soda compress is an alternative to a cool water bath. To apply, soak a washcloth in one cup of cool water and a teaspoon of baking soda. Wring out the washcloth and apply directly to the neck to help relieve the itch. Reapply as needed. Oatmeal: Oatmeal is a favorite remedy for treating itches and rashes. Specialty oatmeal bath products, such as Aveeno, have all the benefits of oatmeal without the mess. Allergy medication: Allergy medication such as Benadryl may help relieve some of the symptoms of the rash, including the itching and redness. Take medication as prescribed and consult a physician if the symptoms worsen or persist for more than a week. 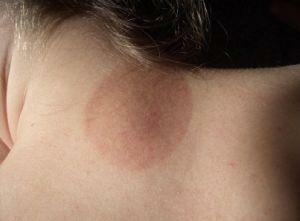 Topical treatments: Topical treatments such as hydrocortisone cream may alleviate a neck itch. Creams and ointments can be applied liberally as needed to help symptoms subside. Rashes that persist for longer than a week or that are accompanied by oozing or bleeding should be diagnosed and treated by a physician. In addition, if a rash persists or is accompanied by systematic symptoms such as fever, headache, dizziness, vomiting or diarrhea, it may indicate an underlying illness or disease that may require immediate medical care.